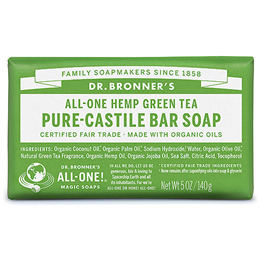 Dr Bronner`s Castile Soap Bar contains a combination of organic extra virgin coconut, jojoba and hemp oils, together with pure essential oils to create a unique soap that cleans effectively without being aggressive. The Green Tea Castile Liquid Soap produces a velvety-lather that leaves the skin silky-smooth and refreshed. It also contains green tea oil which is a natural antiseptic that helps to heal cuts and bruises. Organic Coconut Oil*, Organic Palm Oil*, Sodium Hydroxide**, Water, Green Tea Extract, Organic Olive Oil*, Organic Hemp Oil, Organic Jojoba Oil, Salt, Citric Acid, Tocopherol. Below are reviews of Dr Bronner`s Green Tea Soap Bar - 140g by bodykind customers. If you have tried this product we'd love to hear what you think so please leave a review. I have oily skin and this soap is great for my face. There's no irritation just great feeling skin. 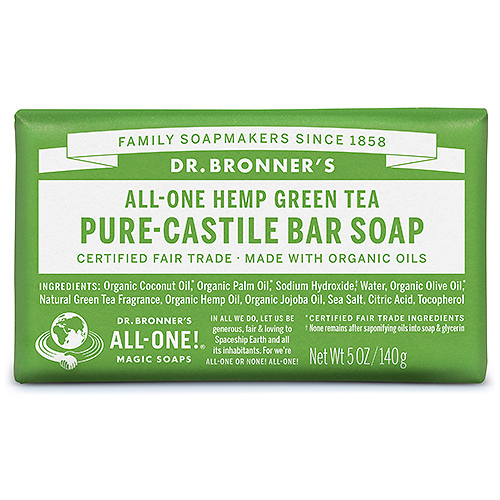 Dr Bronner`s Green Tea Soap Bar contains a combination of organic extra virgin coconut, jojoba and hemp oils, together with pure essential oils, creates a unique soap that cleans effectively without being aggressive.